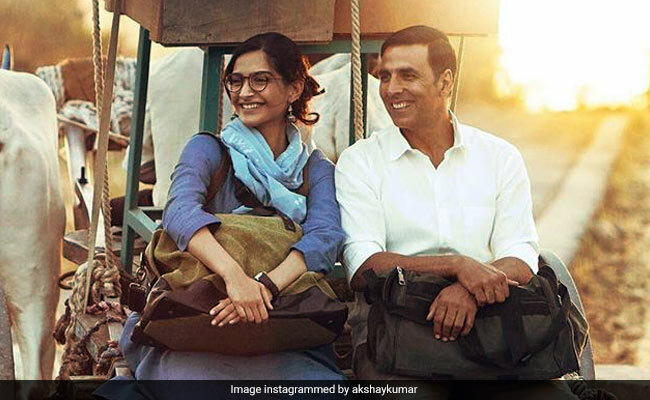 Padman first looks: Tweeting a photo with Sonam, Akshay captioned it: "The STRENGTH behind #PADMAN"
For Sonam's picture, Akshay wrote: "The STRENGTH behind #PADMAN"
In delightful Padman updates, Akshay Kumar revealed the first looks of his co-stars - Sonam Kapoor and Radhika Apte - from the movie and we love them. Tweeting a photo with Sonam, Akshay captioned it: "The STRENGTH behind #PADMAN," while sharing a photo with Radhika, the actor wrote: "The REASON he became #PADMAN." Directed by R Balki, Padman is a biopic on entrepreneur Arunachalam Muruganantham (played by Akshay), who became a popular figure for inventing low-cost sanitary making machines and hence, the name of the movie. Mr Muruganantham felt the need to come up with a convenient solution to tackle menstrual health for women after he learnt his wife used newspaper and rags during her menstrual cycle. Sonam also could not resist sharing her first look from the much talked about film. She added a thank you not for Akshay and the director: "Such a pleasure working with the indomitable Akshay Kumar. He was the perfect person to play the role of #Padman and has brought a sense of humour and love to the film. Of course none of these would have been possible without the humble visionary R Balki." Earlier in August, the first look of Akshay Kumar as Padman pedalled his way to social media like this. The film was scheduled to release in April then but has now been rescheduled to hit screens on January 26. Padman will be co-produced by Twinkle Khanna's Mrs Funnybones Movies and KriArj Entertainment while Sony Pictures has also come on board for worldwide distribution of the movie. The much anticipated Padman is taking fast steps towards its release date, which clashes with yet another Akshay Kumar movie - Rajinikanth's 2.0. Earlier in an interview with mid-day, the actor had said Padman will be moved from the Republic Day weekend if Rajinikanth decides to release 2.0 during that time.